Fabrice Fernandes struck a late equaliser as Southampton came back from two goals down to deny Everton their first win in six games. Wayne Rooney's deflected shot and Duncan Ferguson's header put Everton in command in the first half. 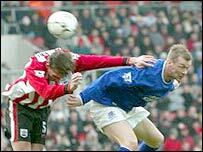 Kevin Phillips pulled one back from close range but Rooney's crisp finish restored Everton's two-goal advantage. James Beattie's 81st minute penalty cut Everton's lead and Fernandes' spectacular goal salvaged a point. Rooney gave notice of his intentions in the opening minute when he pulled a shot just wide from 12 yards, and he opened the scoring six minutes later. The teenager worked the ball on to his right foot from 20 yards out and hit a shot which deflected off Michael Svensson past Antti Niemi, despite the goalkeeper getting his hand to the ball. In their first match since Gordon Strachan's departure, Southampton seemed lacklustre and jaded. So it was little surprise when Everton doubled their lead in the 33rd minute. Thomas Gravesen whipped in a cross from the right and Ferguson's accurate header left Niemi with little chance. The second goal at last stirred Southampton and on 37 minutes Everton keeper Nigel Martyn was forced into action for the first time when he pushed Jason Dodd's dipping free-kick over the bar. Everton could have been out of sight by half-time as Rooney set up Ferguson but from eight yards out the big Scot ballooned his shot over the bar. Southampton caretaker boss Steve Wigley threw on James Beattie and Fabrice Fernandes for the second half and they injected some much-needed passion. Saints' approach was more direct with Beattie up front and it paid dividends on 58 minutes when they got back into the game. A long ball into the box was touched on by Delap and the ball fell for Kevin Phillips who lashed in his fourth goal in five games. Southampton were pressing for an equaliser when Rooney scored his second to apparently knock the stuffing out of them. Ferguson flicked on a long ball to Steve Watson who measured his cross for Rooney to drive home on 77 minutes. But Southampton refused to lie down and with nine minutes left Tobias Linderoth clipped David Prutton in the area to give Beattie a penalty - hich he converted for his first goal in 10 games. Why can Everton only put 45 minutes of decent play together? Is it fitness or attitude? Caretaker boss Steve Wigley's last throw of the dice came up trumps in injury time when Fernandes worked the ball on to his left foot and lashed home a spectacular equaliser from 25 yards. Southampton: Niemi, Dodd, Michael Svensson, Lundekvam (Fernandes 45), Higginbotham, Prutton, Delap, Telfer (Pahars 88), Le Saux, Ormerod (Beattie 45), Phillips. Subs Not Used: Smith, Crainey. Everton: Martyn, Hibbert, Yobo, Unsworth, Pistone, Watson, Linderoth, Gravesen, Kilbane, Rooney, Ferguson. Subs Not Used: Simonsen, McFadden, Naysmith, Radzinski, Campbell. "Southampton produced a thrilling comeback"